An early entrant in the distinguished “crazy Vietnam veteran” genre, “Running Gun Blues” features an ex-soldier turned serial killer. Bowie sounds unhinged in the verses, tries for menace in the choruses, going on about cracking the heads of “gooks.” It’s satire fit for (and seemingly written by) a squalid 13-year-old boy. Mick Ronson offers amends—beefing up the D-C-G riff that Bowie first offers on his acoustic, locking in with Tony Visconti’s bass to ride out the track. It’s no use, as the track’s nothing but cheap, loud burlesque with “social commentary” pretensions. Angela Bowie recalled that her husband wrote the lyrics to “Running Gun Blues” over an afternoon when he kept being interrupted to do interviews, and it shows (“for I promote oblivion/and I’ll plug a few civilians”). As rancid as it is forgettable. Recorded 18 April-22 May 1970; never performed again by Bowie, or anyone else. 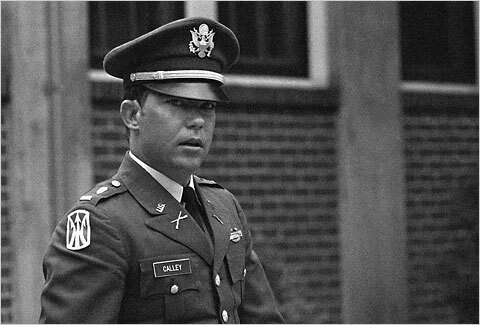 Top: Lt. William Calley goes on trial, November 1970.